One of the world's rarest fungi, an exotic star-shaped mushroom known to exist at only three locations on Earth, has been discovered in the mountains of Nara prefecture. The Devil's Cigar (a.k.a. 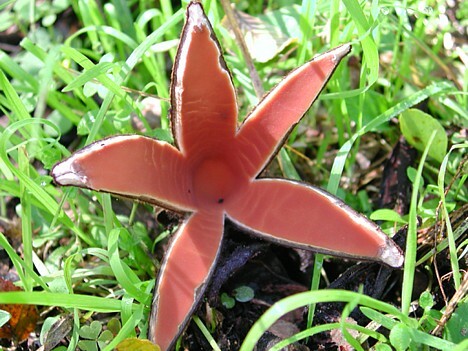 "Texas Star") -- known to botanists as Chorioactis geaster -- had been observed only in central Texas and at two remote locations in Japan prior to the recent discovery in Nara. 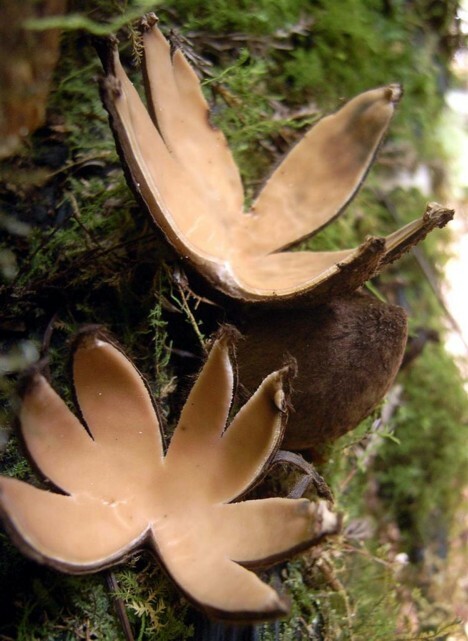 The peculiar fungus is described as a dark brown cigar-shaped capsule that transforms into a tan-colored star when it splits open to release its spores. It is also one of only a few known fungi that produce an audible hiss when releasing spores. First reported in 1893 in Austin, Texas, the curious mushroom appears in a limited area of central Texas each year, and until now, the rare sightings in Japan have occurred in forests in Miyazaki and Kochi prefectures. The fungus is included on the red list of threatened species published by Japan's Environment Ministry. The recent Nara discovery was made by Masakuni Kimura, curator of a natural history museum in the town of Kawakami (Nara prefecture). Kimura first encountered Devil's Cigars in October 2006 while surveying a forest near Kawakami, where he found 12 of them growing from a dead oak tree next to a mountain stream at an elevation of 470 meters (about 1,550 ft). Nearly a year later, in September 2007, he discovered four more of the mushrooms when he returned to the site with Shuichi Kurogi, curator of the Miyazaki Prefectural Museum of Nature and History. Their findings were presented at a recent meeting of the Mycological Society of Japan. The site of the Nara discovery, like the previous Miyazaki and Kochi sites, is located in a humid forest. At all three sites, the Devil's Cigars were observed growing on dead oak trees near a stream. Texas Star, the state fungus of Texas?! In central Texas (which is located at approximately the same latitude as southern Japan), the rare fungus appears during fall and winter, growing from the stumps and dead roots of cedar elm trees. Tsuyoshi Hosoya, head botanist at Japan's National Science Museum, says, "The DNA of the Devil's Cigar from Miyazaki is consistent with the one from Texas. They are regarded as the same species." While it is unknown how this exceedingly rare mushroom came to appear only in Japan and central Texas, one intriguing theory suggests that spores from Japan were swept up in an Asian dust cloud and carried across the globe. Great story, and great pictures! Thanks! Does anyone have a link to the audio of the "hiss" sound? By the way, would you like to exchange blogroll links? I'll go ahead and add you anyway, but let me know if you could. Whoa, that's crazy. It's a wonder of what happens in nature. Shut the hell up. Who do I look like? Rudy Tomjanovich? How similar are the climates and the elevation of the ecosystems in the two parts of the world, I wonder. Parallel evolution, perhaps? Ooh, creepy...looks like something from Alien all the way. this is sooo cool! A fungus that actually looks beautiful! And let's get real - they DNA tested a mushroom and compared it to OTHER fungus DNA on FILE!!!!!!!!!! Wow, now that's really scary! A certain species of trout is found both in Japan and in my home state of West Virginia. A few other small stream species are very similiar or the same as well. I've seen these in Oregon, south east of Eugene, near Dexter. This was in October of 2007. Thank you for this entry. I was in the woods behind my house today and stumbled upon this fungi and experienced the whole hiss and puff of spores. So curious I searched the web, found your site and the beautiful image. Thanks for clearing up the mystery! Oh, and yes! I live in Austin Texas. truly one of god's most amazing creations!!! It really is odd, to all of a sudden find out that something you grew up with is a rare species...We are blessed to be here in the Great State of Texas! and congradulations to Japan, as well. I found these mushrooms (or something that looks very similiar) growing in one of my flower pots in Jackson, MS! I have found them as well in Daphne, Alabama. Very interesting indeed.